Automatic transmission servicing and maintenance is something that is often overlooked and can lead to an expensive repair, not to mention being stranded and having to pay for a costly tow. The transmission in your car is what transfers the power from the engine to the wheels. Of course with the advanced complex computer systems and hundreds of other components used in automatic transmission cars these days, ensuring your transmission is checked regularly guards against major breakdowns. There are many things that left unchecked could affect the condition of automatic transmissions. Oil leaks can possibly result in the transmission burning out and electrical component failure. Radiator malfunctions such as water leaks and poor cooling of the transmission can lead to poor performance and burn out. Oil filter blockage will lead to the transmission being starved of oil. Wear and tear of bands in changing gears resulting in band breakage and loss of gears. Contamination of solenoids causing poor flow of oil through the transmission. There are many more components that interact with the automatic transmission, the list does go on, but you can rest assured that our experienced staff at Automac Transmissions will make the process simple, thorough and efficient, providing you with genuine feedback and knowledge about the condition of your car’s transmission. Our specialist staff can service your automatic transmission and automatic gearbox. We recommend that you service your transmission every 12 months or 20,000 kms. We provide a number of quality assured services that efficiently inspect the condition of your car’s transmission and gearbox, including performance testing. We can perform gearbox repairs and replace parts as needed, ensuring your car’s transmission and gearbox remain trouble free. 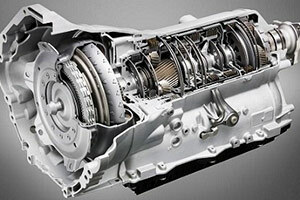 Our team of automatic transmission technicians are kept up to date with the latest technologies and know how. When it comes to automatic transmissions and automatic gearboxes, we’re ready to deliver quality. Often overlooked by vehicle owners, transmission oil coolers are a simple, cost effective solution to help extend the life of your transmission. Overheating is the main cause of transmission failure. High performance applications like towing and high torque engines can build heat in the transmission and break down the vital fluids, decreasing its life and consequently the friction plates, bands, valves, springs, seals, bearings and other internal transmission parts. Transmission fluid works best at lower temperatures. Installing a transmission oil cooler will avoid the inevitable costly repairs triggered by overheating. Remember, transmissions are susceptible to overheating.